Toby Yeung keeps us smiling by creating the colorful graphics and characters with the happy messages behind them. This Hong Kong-based designer not only uses his fun work as a way to communicate with people, but he also likes using it as a tool to bring up social issues. The bright colors he uses don’t just get our attention; they have surely caught the eyes from international brands, such as Vans, MINDstyle etc, as a result of creating a bunch of interesting collaborations and receiving an honorable award “40 Under 40” as one of the most talented individuals in this generation. First of all, would you introduce yourself? 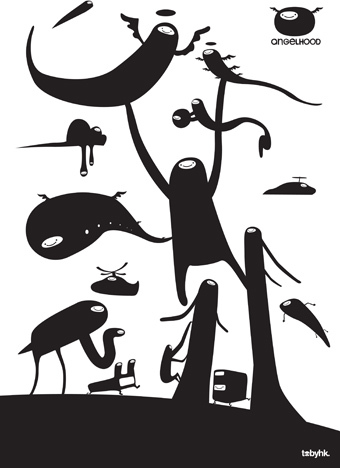 I’m Toby Yeung, a native Hong Kong-based artist and designer with a blend of skills in graphic, illustration, characters and figure design. Under the several brand names created, i.e. CUBEMEN (graphic design), tobyHK (figure design) and Skullove (T-shirt design), I have been actively participating in a lot of events and collaborations with designers of different fields all over the world and have my artworks published in various medias, such as Get it louder, the visual arts gallery, useagain-asia, CustomizeMe. Your character designs are very cartoonish and colorful, what inspired you to create the designs? Do you have a general message behind the happy characters? Character design to me is a reflection of things happening around me. One of the character series was developed based on the colors and shapes of ice-cream that I saw in an ice-cream shop one day. One other series is all about my friends, some of whom may think they are very common with nothing special, but in my eyes they are all unique with particular character. About the color, the interesting thing is I personally love black, but naturally I just make everything colorful and cartoonish, maybe because I really enjoy in the creative process. I love to use some simple graphics and colors to communicate with people, as it is the way to express myself directly. I want to arouse awareness of the world’s social problems with my design as a tool, which has always been my philosophy in design. You were one of the designers participating in the KLOMP! exhibition, would you tell us about the exhibition and your piece as well? 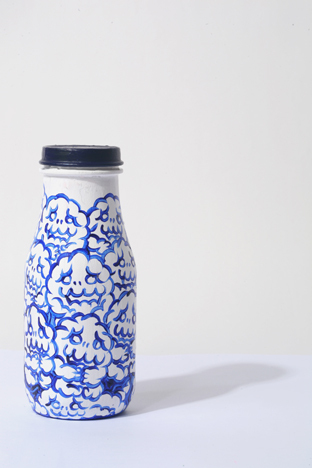 Local Dutch and the Consulate General of the Netherlands have invited artists and designers in Hong Kong and China to participle the KLOMP! exhibition. I have created my new character series “angelhoods”, of which the idea is a group of junior angels who need to go and experience the world for their final exam. I was happy to create this series and it gave me a lot of inspiration while drawing them. I hope I will have a chance to draw on a wall or a room. I believe that would keep giving me inspirations. Also, can you tell us more about the project CustomizeMe? 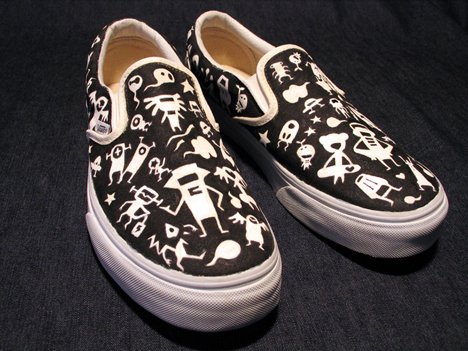 CustomizeMe is a project collaborated with Italy VANS. They invited 50 artists around the world to create something on the Vans Classic Slip-On for the CustomizeMe exhibition in Barcelona and a few other cities. It was exciting to put my characters on a product for the first time. You have collaborated with different parties and brands, which project(s) do you remember the most or like the most? I have done one exhibition with Devilrobots in Hong Kong. In fact that was just a small show but I’m a fan of Devilrobots. So when they asked me to collaborate with their iconic character “to-fu”, I was extremely excited. Also, during Beijing Olympic 2008, I collaborated with the Asian brand “Giordano”. I have designed five characters based on Chinese traditional characters and 30 different t-shirt designs with different sports and they were launched in Hong Kong and China. I like this project and the characters, because they all have good feedback and it was an excellent piece of work to combine the Chinese tradition and the sports. When and how did you first start making figures? What is the story behind you and MINDstyle? Around three years ago, I started working with some figure production. I did some projects in Europe, and MINDstyle noticed my work and they have seen potential in my characters, so we started producing the figures together. After that they wanted to put more resources in Asia and wanted to expand in China, so now I work with them as a Creative Director. How do you compare the toy market in Hong Kong to the U.S. and Japan? There was a period of time that vinyl toys were so hot in Hong Kong, but now it is not as active as before. The market in Hong Kong is small and very trend oriented. Compared to Hong Kong, I think people in Japan love and support the local artists, which makes the market of character design and vinyl toys more solid. In the U.S., it was almost like a new thing to them. 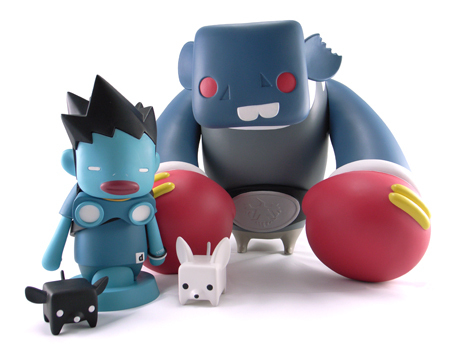 The vinyl toy wasn’t popular until the last few years. “Art toy” is what they call the vinyl toy. So you were awarded “40 Under 40” by Perspective Magazine, how do you feel to be one of the most influential and outstanding designers in Asia? I’m so grateful and happy to get this award and that also means that they recognized my accomplishment, not only in character design, but also interactive advertising. I have always been striving for a balance between my personal pursuits for character design and professional work in interactive advertising. Even after being in the advertising industry for 10 years, I have spent lots of time and effort on character design at the same time. So I’m happy to get the recognition. I think I will remain active in the design industry and continue to be inspired by the people and things around me. I hope I will have my own fashion brand one day and I would like to combine my character designs into the fashion. Do you have anything you like to say to our readers? Set a goal for yourself and keep working on it!